Warning signs: If your child has been swimming all day and is acting listless or sleepy, is throwing up, coughing or struggling to breathe, is light headed or acting in any other peculiar way, call your pediatrician immediately. Your child could be “dry drowning” or “secondary drowning”, which occurs when water enters their nose or mouth, causing the muscles to spasm in the airway, or when water builds up in the lungs causing the child to essentially drown. If it’s an emergency, call 911. These symptoms can occur up to 24 hours after swimming. 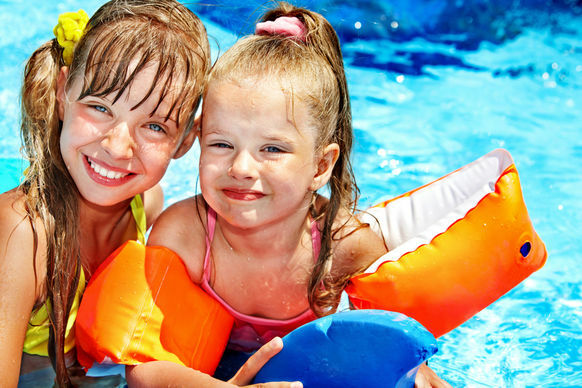 All near-drowning and drowning accidents can be prevented by putting your child into swimming lessons at an early age, making sure they wear their water wings (floaties), and watching to assure they aren’t taking in too much water or struggling. Teach and play Marco Polo with them. Call out their name and then Marco. “Lucy, Marco!” If you don’t hear a response, check to see that they’re safe. It’s a dangerous myth that a drowning child will thrash around and call for help, except in rare circumstances. In reality, a child will be completely quiet as they fight to keep their head and mouth above water, trying to breathe. They will be still as their arms remain lateral, pressing down from the water’s surface, attempting to keep their head above water. As is the case in the rest of our lives, if our children are quiet, something’s going on and it’s time to check it out. The highest drowning mortality rates occur from June to August. We are currently working on an affordable program to help assist parents in keeping their kiddos safe. Please check back soon for availability. The Tom Lennon Foundation has a special interest in this cause, as our own director, Farrah Lennon, almost lost her life to a near-drowning at two years old. She was clinically dead and without a heartbeat when she was pulled from the family pool. Her parents and friends of the family surrounded the pool and didn’t see her go under. It’s so easy to get distracted. Fortunately, CPR brought her back to consiousness and she was airlifted by a Life Flight helicopter to a nearby hospital. She was blessed to make a full recovery. Our foundation has a vested interest in helping to protect your children.